Stenhousemuir hope to pull off a major cup upset against Premiership side St Johnstone in the Scottish Cup in Perth on Saturday. The pressure’s off the Warriors in that most ‘experts’ will rule out their chances of making the last 16 at the expense of Tommy Wright’s men. But Stenny boss Brown Ferguson says it’s important for his side to do themselves justice at McDiarmid Park. He said: “There’s no pressure on the day in the respect if you lose on Saturday there’s potentially no consequence but if you win there’s massive opportunity. “I’m personally looking forward to the game and from the players and fans’ perspective you’d expect everybody to be looking forward to it. “But we approach it in the same manner we do the other games in training. But we’re away from league business, wer’re going to play against a very good, very experienced top six SPL side away from home. “It’s going to be a very difficult challenge for us on Saturday but it’s a challenge that’s put down in front of you and it’s there to try to rise to that occasion and put in a performance individually and collectivelty that we believe we are capable of doing. “To get to the fourth round for the club has been important, it adds to the momentum and it’s all been something we needed to do as a team. 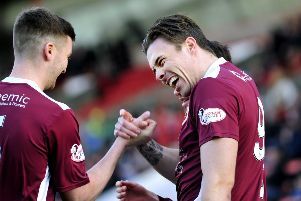 Stenhousemuir’s morale is high after moving off the bottom of League One with what Ferguson said was their best performance of the season against Stranraer. However they will be without suspended defender David Marsh, booked twice in earlier ties. On-loan Ally Roy is back training with Hearts after his recent injury against Alloa and his readiness will be assessed.